With Halloween in exactly ONE WEEK I decided to put together some easy DIY Halloween costumes! You’ll be sure to look cute and you can wear these again! The first costume is Boo from Monster’s Inc. If you have not seen Monster’s Inc. you’re missing out. The cute Disney movie will have you love this little girl that Mike and Sully named “Boo”. Â She snuck into the Monster world and now Mike and Sully are trying to get her out. The second costume is Cheryl Blossom from the CW show Riverdale, which is based off of the Archie Comics. Cheryl is from the well-known Blossom family and is the Captain of Riverdale High’s cheer squad knows as the River Vixens. Last, but not least Olivia Newton-John in her Let’s Get Physical music video. If you’re not some type of workout person for Halloween are you really doing Halloween right? Hope these helped! If you have any suggestions put them in the comments below! Boo from Monsters Inc is so cute! And simple!! Thank you! I thought so too! You can also wear each piece of the costume again! Iâ€™m always stumped for Halloween ideas. Your list is so easy even I could do it. Thank you! I’m stumped as well when it comes to Halloween ideas. I wanted to do something simple and easy to get that you can wear the pieces again rather than once. I love diy costumes! My daughters costumes were made my me both last year and this year. Except this year, sheâ€™s matching with her newborn brother as salt and pepper shakers! Canâ€™t wait to see them dressed up. That’s so cute! I love the salt and pepper shaker costumes! Wow. These are inexpensive Halloween costumes. Thanks for sharing. We don’t usually dress up for Halloween but I would pass on these suggestions to my nieces. Of course! In the past couple of years I’ve been really lacking in the Halloween costume area. 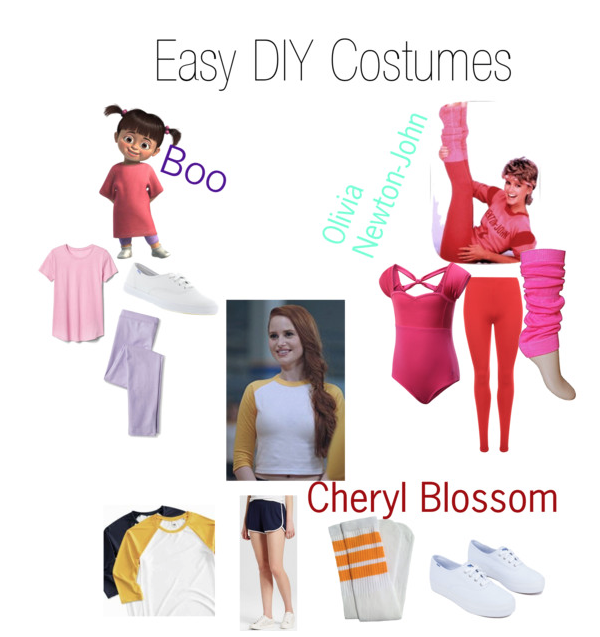 These Easy DIY Costumes gave me new ideas! The ONJ costume is hilarious! LOVE it! I love these ideas! I can never think of something to go as. It was so much easier when I was little! These are so cute and simple. My favis Cheryl Blossom–Riverdale is my fav show! Yes, I love the Cheryl costume! However, I think my favorite character on the show is Veronica (or Archie)!